Jessica Field holds a Masters degree in Teaching & Learning. She is currently in her twelfth year in education, and lives just outside of Richmond, VA. She has taught every grade level in elementary school with the exception of Kindergarten. Currently, she works as an Instructional Coach to lead middle school teachers on best practices in literacy. She also works with teachers within the DoDEA (Department of Defense) schools sporadically. She also works with Grand Canyon University as a Student Teacher Supervisor for the past four years. In the past, she had the unique opportunity to virtually coach beginning teachers for the National Education Association (NEA), and has been very active with the NC Department of Public Instruction (NC DPI). She worked for several years with a local community college to teach Substitute Teacher courses, and was a Consultant with NC State University on text book committees, and created/evaluated test-bank items for various assessments including common assessments, and NC Teacher Licensure exams. This is an opinion piece from one of our writers. 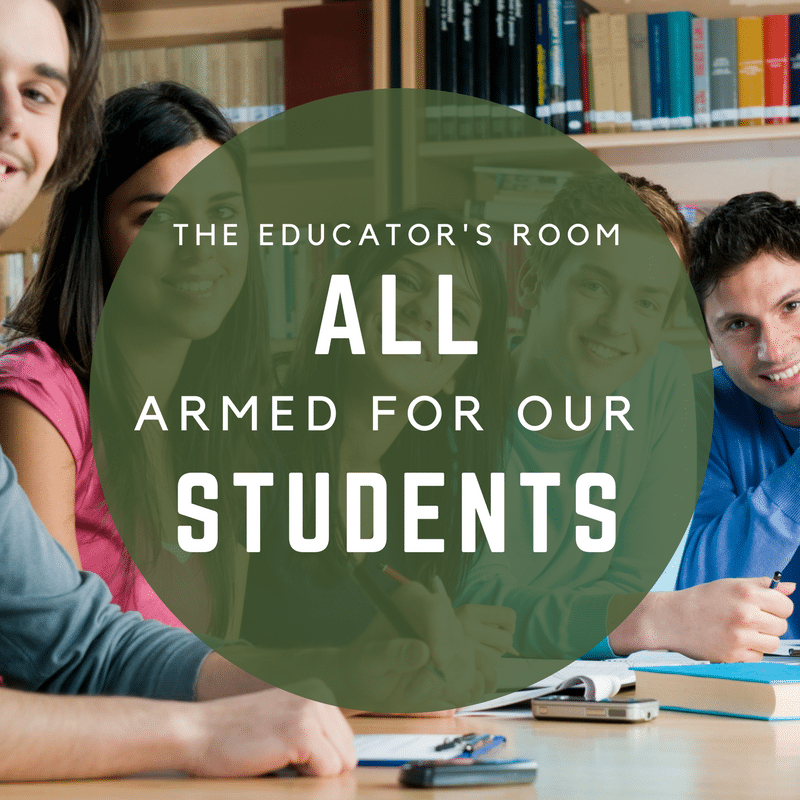 To read more of our opinions around (not) arming teachers, please click Dear Generation X, #ArmMeWith Campaign, and many more here. In the wake of the recent tragedy in Florida, some people have been quick to call for (more) gun control. The usage of guns should be controlled, but not with the typical definition of those who are seemingly calling for it. Each state has their own laws, but one thing remains throughout most of the nation: schools (kids) are in gun-free zones. Armed intruders know that those on campus will be unarmed. There may be a lone security guard if they haven’t called out sick that day. In the war against school shootings, we “shouldn’t bring a knife to a gunfight”. However, when we don’t even consider arming teachers, we are showing up the ‘gunfight’ empty-handed. Consider this a call-to-arms- Our teachers should be armed with the tools they need to get the job done, even if that includes a firearm. This generation has grown up with completely different experiences than us older folks who are nearing 40. (This is a pattern of course, but I think it’s just taken me a while to finally see it.) I certainly still think of myself as fairly young, but I’m not; I’m old. I recently asked eighth-grade students to create a playlist for an I-pod with a few songs in order to complement a personal narrative unit they were working on. Ten minutes later I found out that after surveying and conversing with the students, I knew almost none of their songs. The divide goes far beyond songs. Our students learn differently now, and teaching styles are very different from how we learned when we were in school. Society has also changed. Brutally violent video games are “raising” our students, with some parents who do not make time for conversations with their children. Some of our students are yelled at for existing, or just simply dismissed at home like they’re a nuisance. You know it happens. You report it. D.S.S. just calls it “bad parenting”. There are warning signs, and we, as teachers, report them. What happens when parents don’t do their part of the job though to promote the social-emotional health and sense of security of our students? After the Sandy Hook school shooting in Connecticut, I shook for days. At that time we didn’t have a security officer, and we had a very open campus. Our building doors were locked overnight, but that was about the only time. In a moments notice, my cute elementary school was now turned into a prison. Our once open classroom doors were now mandated to be closed, and locked all day long, in addition to the glass window pane being covered and the blinds completely shut. Many of the victims of that school shooting were first graders; these could have been my first-grade students. They were innocent babies who had their whole lives to look forward to; their poor parents who kissed them (unknowingly) goodbye for the last time that morning. Here we are, six years later, and just about a week ago, 17 more parents kissed their babies goodbye for the last time. What’s worse is that there is a pattern of school shootings, despite some precautions, and a real solution isn’t being permissible. Some educators in North Carolina, Georgia, and Missouri can possess firearms as long as they are locked in their cars. That won’t do them much good if a shooting happens on campus, but it’s a start to the acknowledgment that teachers need different “tools” now to protect the welfare of children. In Massachusetts, Louisiana, and Nevada, a teacher can carry a gun on campus with written permission from school officials. Personally, I have the license to carry a firearm, and wouldn’t hesitate to defend my students’ lives with this if there was an emergency (if it was permitted on school grounds). Teachers are the first line of defense in school shootings. Let’s replace those antiquated “Gun Free School Zone” signs with warning signs that read that armed staff members “may use whatever force is necessary to protect our students”. NBC News. (2018). ‘F’ Is for Firearm: More Teachers Authorized to Carry Weapons in Classroom. [online] Available at: https://www.nbcnews.com/news/investigations/f-firearm-more-teachers-authorized-carry-weapons-classroom-n208946 [Accessed 20 Feb. 2018]. Pearle, L. (2018). School Shootings Since Columbine: By the Numbers. [online] ABC News. Available at: http://abcnews.go.com/US/school-shootings-columbine-numbers/story?id=36833245 [Accessed 20 Feb. 2018]. Severson, K. (2018). Guns at School? If There’s a Will, There Are Ways. [online] Nytimes.com. Available at: http://www.nytimes.com/2013/09/28/us/guns-at-school-if-theres-a-will-there-are-ways.html [Accessed 20 Feb. 2018]. I like the idea of being empowered, literally. My husband and I own guns. I could carry, but I am not the right person to do that. I could never shoot a student. Bottom line. I also fear that some armed teachers will be corrupted by power. I see your points, and I have considered them myself, but I wonder if that is headed in a direction of violence begets violence.